Change is something that illicits fear and loathe amongst most of us. We are comfortable living in our own little bubble, going about our daily lives as if on automatic pilot. While this may seem like a good thing it is anything but. We begin to stagnate in all aspects of life, work, relationship, intimacy, family, exercise and the list goes on. This eventually leads to a long list of woulda, shoulda, coulda’s and ultimately, regret. Well, I am here to say that while it is a very scary thing, change is essential for us to grow and reach our true potential, in essence, change is good. The Japanese have a name for the process of continuous incremental change. 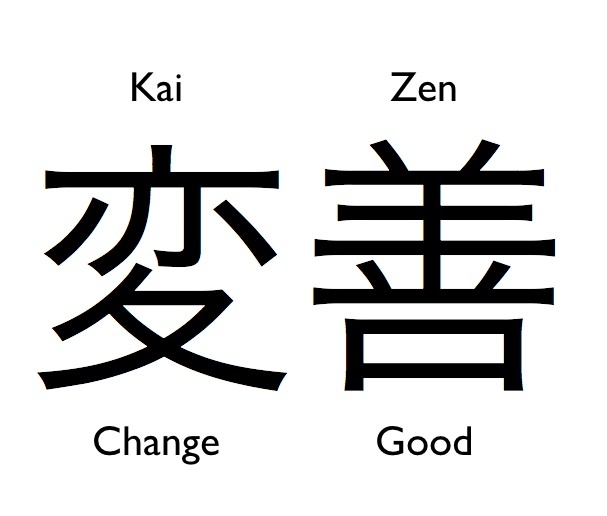 They call it kaizen, which literally means, "change good". This approach involves deconstructing a skill or activity and making incremental improvements to each element in turn. A commitment to continual growth and progression can be extraordinarily powerful. If you stick with it, you will find that you have made significant progress in that specific aspect of in which you desire something different, something better. Observing your incremental progress will spur you on to continue to fine-tune your skills. It will create a momentum that keeps you motivated even when you're not in the mood. Breaking down the process into small, achievable steps prevents overwhelm and procrastination. Getting better at a skill or activity feels good and this will keep you engaged. Small improvements made consistently over time lead to exponential growth. And perhaps most importantly, this approach helps to keep you mindful and attentive. All of this is fine and dandy but one must understand, appreciate and except that learning and growth can only take place when one is focused and engaged. Mastery of a new skill takes practice, and not just any type of practice. If we find ourselves mindlessly go through the motions, repeating skills that we are already accomplished in, progress will be very slow going, making it easy to say this doesn’t work and to simply give up. Deep practice, on the other hand, requires three elements: deconstruction, repetition of specific skills and focussed attention. Breaking down skills into smaller steps makes them more manageable, aids in the learning process and helps to establish a momentum of success. Each small win will increase your sense of confidence, optimism and self-efficacy and this energy will propel you forward. Mastery takes time and patience. Learning in the brain is not a one and done process. We weren't able to walk the first time we placed one foot on the ground, nor were we able to zip along on our bikes the day we took off our training wheels. We learn by repetition--responding to feedback and making continuous adjustments. For something to take root in your brain, requires that you are paying close attention. Only when a new skill is clearly represented can it be securely stored at the neurological level, and this takes effort. Improvements show up in the strangest places. You may feel taller, find it is easier to focus, you may find yourself wanting to accept more difficult challenges or you may simply find yourself more at ease. Or, on the other hand people might comment that you seem calmer or more centred, happier, more productive. No matter the reason why, or what you are trying to accomplish, embrace change, accept it and do everything in your power to make those changes in your life you desire to become the best you, you can be.